“Oversight” and “sanction” are far from the only English words that are their own antonyms. In the last post I referred to these two-faced words as “contranyms,” which is the most common term for them. But word buffs love coining terms. They’ve come up with almost as many names for this class of words as words in the class. 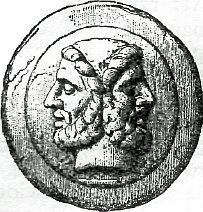 Alternate terms for “contranym” (also spelled “contronym”) include “auto-antonym,” “antagonym,” “enantiodrome,” “self-antonym,” “antilogy” and “Janus word.” The last is from the Roman god of beginnings and endings, who is often depicted as having two faces looking in opposite directions. One set of contranyms arises when nouns become verbs meaning either to add or remove the noun in question. For example, when you dust are you applying dust or removing it? It depends whether you’re dusting the crops or the furniture. If you seed the lawn you add seeds, but if you seed a tomato you remove them. And, needless to say, stoning the peaches is not the same as stoning the villager. Moving to a more cheerful topic, take the word “trim.” Although the verb form predates the noun, this is another verb that can mean either adding or taking away. And the context doesn’t always make it clear. If you’re trimming the tree are you removing excess growth or are you adding decorations? All right. I’ll trim this post with an illustration of Janus and consider the second installment of contranyms finished. This entry was posted in etymology and tagged contranyms, contronyms, dust, English language, Janus words, seed, stone, trim. Bookmark the permalink.